The sprinters are afforded one more opportunity to strut their stuff ahead of the race’s entrance into the first true mountains of this year’s Tour de France. Stage 6 is a 190.5km route from Arpajon-Sur-Cére to Montauban, a day where lumpy terrain transitions towards the oncoming mountain passes which will ignite the first moves in the battle for the maillot jaune. Luckily for the sprinters though, today’s finale is a flat affair and should inspire enough teams to chase down the day’s breakaway in order to set up a bunch kick. André Greipel has done a fantastic job of avoiding a stage win up until now, but today’s offering should be dominated by his Lotto-Soudal team and subsequently lead the charge for today’s battle. The approach to Montauban is a rather technical affair and will demand a strong team to guide their leader through the obstacles before dropping him off in the final meters; Lotto-Soudal can do precisely that. The finishing straight suits a power based sprinter more than any other, and for that reason, Greipel must be viewed as the favourite. Mark Cavendish may not be able to generate the huge watts of his rivals, but he is an extremely wily character who is certain to have studied today’s finale in order to thread his way to the fore before attempting another cunning sprint. His leadout train has proven its abilities in this opening week and looks to have gelled efficiently enough to rival the big name sprint teams. Out of all the contenders for Stage 6 honours, Cavendish looks the most likely to capitalise on the potential errors of his anticipated competition here. Marcel Kittel caused quite a stir to take victory upon Stage 4 and has sent a strong message to his rivals that his usual potent form is beginning to return to him. The German ace is capable of churning out huge watts on a finale such as this and it is plausible to suggest that Stage 6 will be decided with a drag race between himself and fellow countryman André Greipel. Dylan Groenewegen has begun his ascent to sprinting’s top table in 2016 and should not be discounted from causing an upset here with his immense turn of pace. The Dutchman has spent most of his time in the sprints thus far making up ground late on, but if everything clicks today and he is delivered into a good position, then he is clearly a contender. 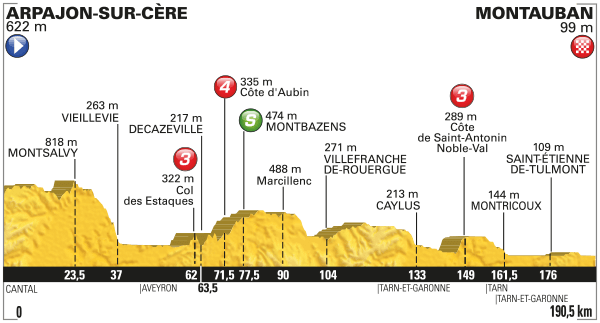 Expected to complete the placings on Stage 6 are Bryan Coquard, Peter Sagan, Edward Theuns and Dan McLay. Posted on July 7, 2016 by Spokenforks	This entry was posted in Le Tour de France, Le Tour de France 2016, News and tagged Andre Greipel, Bryan Coquard, Dan McLay, Dylan Groenewegen, Edward Theuns, Le Tour de France, Le Tour de France 2016, Le Tour de France Stage 6 Preview, Marcel Kittel, Mark Cavendish, Peter Sagan. Bookmark the permalink.